I have been through and transcoded all MXF referenced sound clips to Wav by simply exporting them from FCPX and then reimported and manually placed them into the timeline.. Lets hope it works! EDIT: Initially I had no luck but then narrowed down the media locations in prefs and it worked! Hooray! Last Edit: 3 years 2 months ago by mrolt. 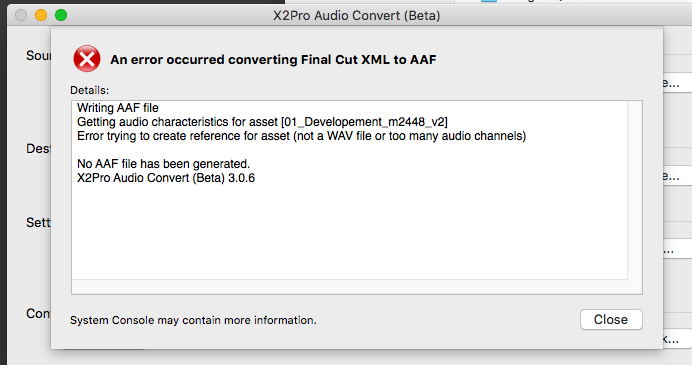 Yes, In the error message that you posted, it sounds like it is an issue extracting audio from an MXF file. 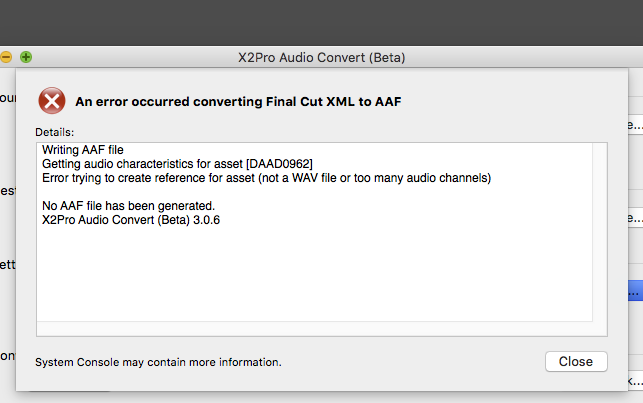 X2Pro does support audio in MXF files, so there may be something strange about the files. If you are not using the audio from these files, have you disabled the audio on them in you FCP X Project? If so, you may be able to choose to "discard disabled clips" in X2Pro's preferences, and it might skip over the problematic files. I believe my problem is that although most of the XML refers to Wavs recorded by my sound recordist and synched, the pick ups were shot with a mic directly wired in. So the XML is looking at MXFs and the sound therein. I think X2Pro s having trouble accessing these MXFs. Could that be it? So basically I learnd that any kind of media that is not wav – like anything coming from a camera (mov, mxf ...) – will not work with the "reference option" since this works only with wav-files. So normal workflow – just forget about any kind of reference – create a aff-file with handels and thats it. I've tried deleting the media that seems to kick up an error message it seems to reference a different clip no matter how much I delete. Which suggests its not the media, I reckon. ? I keep getting the XPC response. Does this beta work? Can I get hold of it? is because you are trying to convert your project with the "Reference WAV files in place" option checked, and in the "Handling media that can't be referenced" section of the preferences, you have it set to "Generate an error and don't create AAF file". 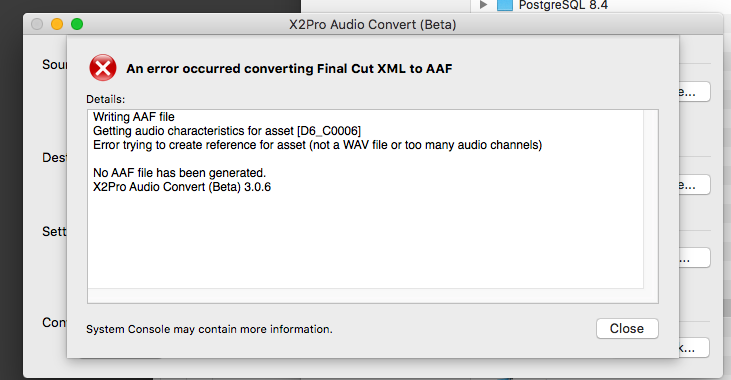 X2Pro will not reference non-WAV audio because Pro Tools, and most other DAWs won't open referenced non-WAV audio. Do you really want to "Reference WAV files in place"? This option will not embed audio from WAV files in the AAF, but if you have audio from other sources (mov, mxf, etc), the conversion will fail, or it will need to be embedded. The simplest solution would be to turn off "Reference WAV files in place", but if you do really want to "Reference WAV files in place", and you want to have X2Pro embed non-WAV audio, make sure that in the "Handling media that can't be referenced" section of the preferences, it is set to "Embed the media, optionally trimming". Will pop you a mail with our ftp details or you can respond to that with the password for us to download from your ftp. To confirm we will need the appropriate XML and corresponding media file that causes the issue. PW: how can I let you know the password? But, I tried it with 3 different filmes out of FCX allways there is one file that seems to block. Doesn't look like a corrupt file – message allways the same. Are you able to make available the file in question DAAD0962 ? As well as the XML ? Many thanks and so your aware this is now raised as ticket 6093 here. Last Edit: 3 years 2 months ago by James Carrick. Unfortunately it is still with development, will chase them today and get back to you. installed the new Beta-Version, but unfortunately it doesn’t work with the option „leave files in place“! It works though with exporting all audio, ending up with some 4GB .aaf-file that means its eating up a lot of space. The rlm-Version has no more licence seems it is expired. I was also sending you the log-files of my mac. Hey, I bought this program last night and getting the "Error Timed out waiting for XPC response" message - can I get an older version in the hopes that it will work for me as it did for other? I am not sure how to contact you directly so hoping this will reach you! I have a mix session this week and this snag is a big problem for me. I hope you are having a great start to 2016! I wanted to see if you had received an email from James concerning a 3.0.6 Beta release that we thing fixes this issue with the XPC timeout. If you could try that BETA version on your FCPXML and let us know how your testing goes, it would be much appreciated.